Eliza Carmarthen was the daughter of John Williams, a currier; who was known throughout South Wales. 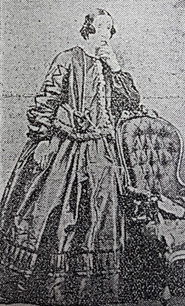 She was born in 1825, and her father’s home was at 30, King Street, Carmarthen, just within the shadow of the ancient Parish Church of St. Peter. John Williams claimed close relationship to Lord Milford, and his wife, Anne Lewis, was a daughter of The Old Bull, a well-known eating-house nestling near the Guildhall, in the centre of the town. The Old Bull was famous for its sumptuous fare and it’s very moderate tariff. Indeed, and old menu card showed that for 4d, roast chicken and two vegetables, rice pudding, treacle and home-brewed ale was served. Eliza was one of four children, and as her parents were wealthy she was educated at private schools in England and later in France and Germany. She spoke several languages and wrote poems that became very popular. Her cultured mind and her active interest in social work won for her many notable friends, who frequently visited her at her home in King Street, Carmarthen. Bishop Thirlwall was a welcome guest there, and Christmas Evans and Joseph Harris (Gomer) were frequent visitors. Henry Richard, the Apostle of Peace, stayed there, and John Bright once addressed a gathering that crowded the thoroughfare from an upper window of Eliza’s house. Eliza was twice married. Her first husband was John Saunders Hughes, pastor of Mount Pleasant Church, Swansea. He was a kinsman of the present pastor of the Cardiff Tabernacle, the Rev. J. Williams Hughes. Her second marriage was to Thomas Johns, vicar of Hirwaun near Aberdare. That haunt my aching brain. Some notes of echo from that distant home. Towards the blue waved main. Eliza was also ab accomplished musician, and her death in 1872, at the age of 47, is associated with one of her efforts in composition. A service of praise had been held at the parish church, and among the hymns sung one bore the refrain: “When will Thou come, to free this captive soul of mine.” Eliza felt that the selected tune did not do justice to the words, and after returning to the vicarage that evening she sat at the organ and composed a new tune. Until late in the night she was heard singing the words that had so appealed to her to the new tune. That night she died in her sleep. Her captive soul had been freed. “Eliza Carmarthen.” The funeral of the late Mrs. Johns, better known in the literary world as “Eliza Carmarthen,” took place on Monday last. The principal places of business at Hirwain were closed, and several hundreds of persons, including many clergymen and ministers, followed the hearse containing the remains of the deceased lady to their resting-place in the Aberdare cemetery, where the beautiful and solemn burial service of the Church was impressively read by Canon Jenkins, vicar of Aberdare, and the Rev. W. David, rector of St. Fagans. Funeral Sermons: On Sunday last funeral sermons in remembrance of the late Mrs Johns (Eliza, Carmarthen) were preached at Hirwain Church, morning and evening. In the morning the Rev. W. Johns, curate of St. Elvan’s, Aberdare, preached a very able and appropriate sermon in English from the dying words of Joshua: “Behold, this day I am going the way of all the earth.” In the evening a Welsh sermon was preached by the Rev. David Davies, curate of St. Mary’s, Aberdare. His text was, “Blessed are the dead which die in the Lord,” &c.